Why Did Luke Replace the Anointing of Jesus at Bethany with the Sinner Woman Washing His Feet? The first two gospels portray Jesus being anointed by an unnamed woman in Bethany in order to “prepare him for burial.” In the third gospel that scene has been removed and replaced with another, set earlier, of an unnamed woman anointing Jesus’ feet. We have enough DNA to identify Luke’s story as derivative of the one found in Mark and Matthew. (Thomas Brodie further identified 2 Kings 4:1-37 as an additional source.) Clearly the author of the third gospel did not believe he was reading a “historical memory” in the earlier gospel(s) or that he was composing a version of history. The author recognized the earlier narrative as composition with a certain message that could be erased and rewritten in the interests of preaching another message deemed more appropriate. So what was the alternative message? Why was the theme of the first account “repealed and replaced”? but has sent the rich away empty. . . .
Luke has a special interest in those kinds of reversals. I have listed several of them in my 2007 post. So the anointing scene is removed to a place and occasion where Jesus shows once again how he exalts the sinner and the lowly. 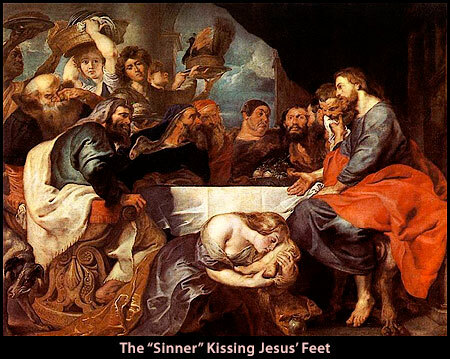 The woman is anointing Jesus’ feet, not his head. She is acting as the lowest servant, not someone with a fortune in her hand who has the honorable task of proleptically anointing the future king. The riches are found in the depth of her love and the corresponding greatness of forgiveness. Posted on 2018-01-15 20:18:37 GMT+0000 by Neil Godfrey. This entry was posted in Biblical Studies and tagged Gospel of Luke. Bookmark the permalink.